A man who drove a boat into a jet ski, causing life-changing injuries to its passenger, has been fined £5,000. Michael Bartlomiej Dornyek, 38, from Jersey, admitted driving the speedboat without due care and attention. But he denied operating the boat in a dangerous manner along with grave and criminal assault at Jersey's Royal Court. Lawyer Giles Corbin nearly lost a leg in the crash in St Brelade's Bay in Jersey on 9 July 2017. He was thrown from the jet ski into the water and told by doctors his left leg might have to be amputated, the court heard. But following a 12-hour operation to reconstruct muscles and ligaments around his left knee, he is now walking with the help of crutches. The court heard how Dorynek's boat was travelling at speed with nine passengers, including four children, when it struck the jet ski. Dorynek told the court he thought the jet ski would change direction as both vessels approached each other, but it was not until the last moment he realised that was not going to happen. Mr Corbin said the boat appeared from nowhere and he heard screams just before impact. 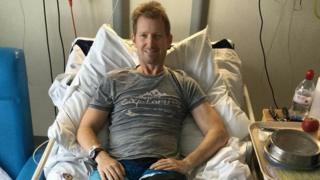 In a statement, he said simple every day activities "were now impossible" following the 12-hour operation to reconstruct muscles and ligaments around his left knee. Sentencing, Judge Sir William Balhache said it was the view of the court that "both parties were at fault" and both drivers had "failed to keep a proper lookout". Sir William acknowledged Dorynek might feel aggrieved that he was the only one being prosecuted when both parties were equally careless. Mr Corbin said he would now launch a civil case against Dorynek.